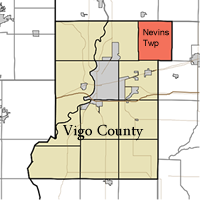 Nevins Township of Vigo County received a $5.2 Million grant from the Indiana Department of Natural Resources Division of Reclamation/Restoration (Grantee is Nevins Township Trustee, Carl Gregory). This grant is to supply potable water to the areas that have been impacted by coal mining. The inception of the Nevins Township Water Project was March of 2003. The IDNR grant was signed in July of 2009. A lot of people, time, and steps, too many to name, have been taken to make this a success. This is the FIRST project using this funding agency in the state of Indiana. If the groundwater in your area has been impacted by pre-law coal mining activities, you may be eligible for these funds, and the local township trustee can make application for such funds. The phrases used most of “Just ask”, “All you have to do is ask”, or “You have nothing to lose by asking” can hold true in a situation described as above. The Nevins Township Trustee made what he thought was just a simple phone call. He asked if there was any money available to put good drinking water in homes with bad water due to old coal mines. The answer was “Yes”, and the township trustee has now received a $5.2 million grant to solve the problem.